We know there are many choices out there, come be a part of the Lynn Smith Chevy family. We are always learning and looking for ways to improve our employees’ skills and most important, our customer’s experience. Lynn Smith Chevrolet is a family owned/operated dealership, serving the DFW metroplex. Mr. Smith has always been in the car business, working at the GM plant, then having many tote the notes in the 1980’s. Finally opening up his Chevy retail dealership in 1991. We prefer to promote within, and have many long term employees and most managers have risen from within. Our most important goal is taking care of our guests and making them feel at ease in this process. We are constantly training and would like to switch to an appointment based model to cut down on our wait times. Our GSM, Craig Riggs, started with us 6 years ago at a satellite used car lot in Cleburne. After 1 year he came to work here at our main location in used cars, moved up to be the Used Car Manager and just in November became the General Sales Manager. 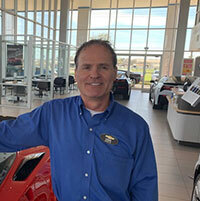 Our Parts Manager, Scott Moore, started on the counter selling parts 20 years ago. 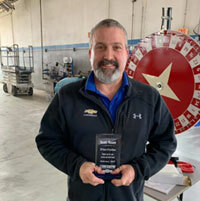 He took over as the Parts Manager 9 years ago, we are very proud of his accomplishments. All four of our sales managers were promoted from the sales floor. This gives them a unique perspective of how hard it is to be a salesperson in these times, and gives them the ability to train our young sales staff. We support the Harvest House in Burleson, Texas. We participate in their food drive and angel gift drive during the holidays. We support Chevy athlete of the week.